My first attempt at using all my new crafting supplies to make a card. Today is Read Across America Day, and I thought it would be fun to have my first attempt at card-making coincide with it. The program is geared toward fostering a love of reading in children and is sponsored by the National Education Association. It also coincides — not coincidentally — with Dr. Seuss’s birthday. Parents and other caring adults are encouraged to read with their kids today. So here it is: My first card. 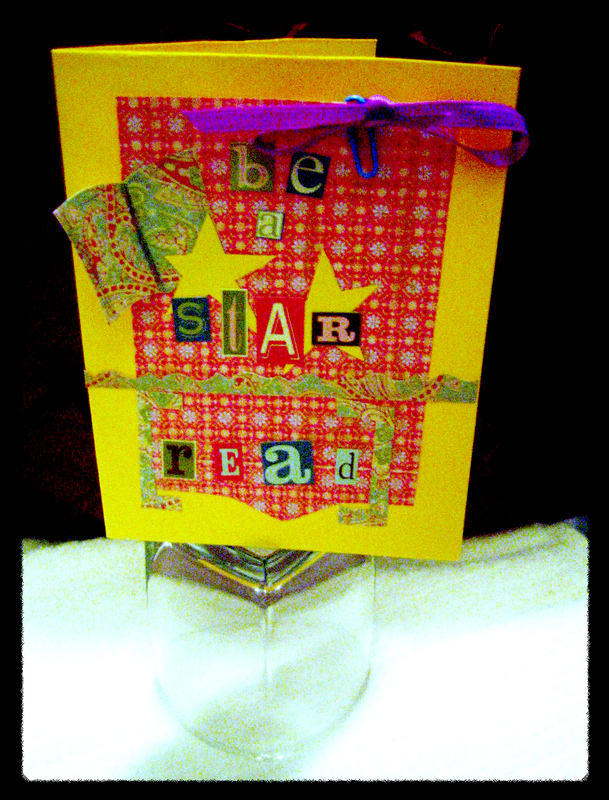 It’s based on an idea in the A Card A Day book I’ve mentioned, but the “be a star” part is my idea. I’ve decided it’s alright, for a first attempt. I was blessed to have parents who read to me often when I was a child. I’m sure that’s a large part of why I love to read so much now. Before I could read, the book I most asked my parents to read to me over and over was Are You My Mother? by P.D. Eastman. After I could read on my own, I loved the Little House books by Laura Ingalls Wilder and the Ramona Quimby books by Beverly Cleary. So what were your favorite books as a child?